The Piusi Premium Rotary Manual AdBlue™ pump is specially designed for the transfer of AdBlue™ (DEF) from a drum, where there is no access to power or where the quantity dispensed is not high enough to warrant a more expensive electric pump. Thanks to its careful design and Italian construction, this Piusi pump has a higher specification compared to other AdBlue™ hand pumps on the market in several ways. Benefitting from a Stainless Steel outer casing as opposed to plastic, this Piusi AdBlue™ pump is more durable, giving it a longer life span. It also has a much smoother operation for the user thanks to its rolling hand grip and quality internals. The inlet of this AdBlue™ drum pump benefits from a grooved locking mechanism for securing it tightly onto the drum connector. This stops it from spinning on the drum whilst in use; a common issue with cheaper solutions that can result in the AdBlue™ hand pump coming loose and leaking. There is a ready to dispense version of this AdBlue™ transfer pump that comes with a 2.5m delivery hose and 19mm stainless steel spout, which comes with spout stopper to reduce crystallisation that can cause mess and blockages. 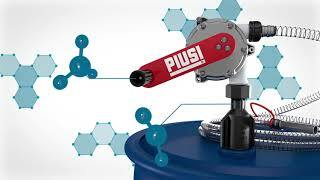 Watch how the Piusi Premium AdBlue™ Hand Pump offers smooth, sturdy and more durable manual dispensing.